Vietnamese Rice Paper Snacks – Are You Sure You Know The Differences? Have you ever held a Vietnamese roll in your hand and wondered what it was made from? Your friend told you it was rice paper, banh trang, but you are 100 percent sure that you’ve been told that a couple of times before when you were eating totally different dishes. Confusing right? Along with a huge range of Vietnamese noodles, rice paper is one of the most common ingredients in Vietnamese food. Creative Vietnamese can make tons of different dishes out of just one type of rice paper, and there are many types. It’s not only foreigners who get lost in the maze of figuring out which is what, but also some of us locals, including me! I remember one situation where I was introducing my friend to a rice paper roll, and I was staring at it for at least 30 seconds before I could think of its proper name. Embarrassing, right? Well, I’m going to clarify everything for you in this article. In Vietnam, we use rice paper (banh trang) as a wrapping material for many kinds of Vietnamese main courses. But in this article, I’ll talk about rice paper snacks – the favorite street snack of many Saigonese. In this article, you will discover general facts about rice paper, what the differences are between the various rice paper snacks, and where to find the best places in town for this snack. For those who’d love to make this at home, keep reading. I divulage all the ingredients that one uses to make these delicious snacks. One must wet rice paper for use. Rice paper – banh trang was first made in the South of Vietnam and then spread throughout the country. It has different names as you move further afield. In the North, we call it banh da or banh cha in central Vietnam. Rice paper is made from a mixture of rice powder, cassava flour, and water in a specific ratio. Combined they create a milky liquid. When the liquid is ready, you use a coconut shell spoon to pour a thin layer onto a cotton fabric cover over a boiling pot of water. Once it cooks (or solidifies), use a thin bamboo stick to hang it on a bamboo woven mat in the sun. Because it depends on how sunny it is, the drying time is flexible. When you check it, and it breaks easily, then it’s ready to use. 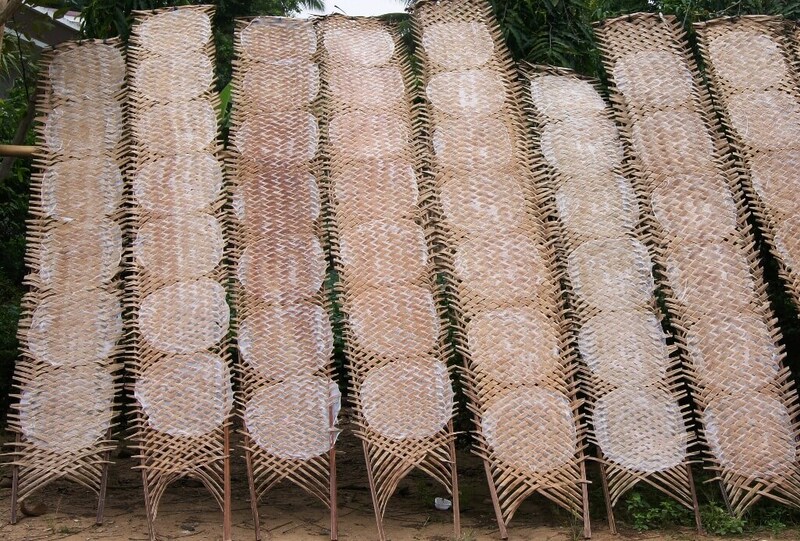 You can make the rice paper thin or thick – it depends on what one uses the end result for. We use the thin version for wrapping food, and the thicker one for grilling. Mung bean flour, corn flour, and coconut water are sometimes added to the liquid to make the rice paper taste better, along with some seasoning like pepper, salt, or sugar. You can also choose the topping: Sesame seeds, shredded coconut meat, onion, and sometimes tiny shrimp. It’s all up to your creativeness and personal taste. The drying process is quite innovative. It sounds like an odd question to ask, but surprisingly, many people have searched for the answer. So here you go. You can easily buy rice paper on any street side grocery shop, local market, or supermarket in Vietnam. If you are not in Vietnam, it’s available on Amazon. Type in “Red Rose Rice Paper” brand on the Amazon search tool, and you’ll find it. Now place your order! If you are looking for the best, then rice paper from Tay Ninh, a province in the north west of Saigon, is what you are looking for. If you are around Tay Ninh, don’t forget to get some, or maybe a lot! What do people use rice paper for? Well, eating of course! Edible rice paper is mainly used to make fresh summer rolls (salad rolls), fried spring rolls, and to wrap food from some other dishes like Vietnamese pancakes. Recently, we found another way to use rice paper. We turn it into snacks: rice paper salad, stuffed rice paper rolls, grilled rice paper (aka Vietnamese pizza), etc. You can even eat just the rice paper itself after briefly soaking it in water. Try it. It makes an interesting, chewy, afternoon snack. For those who wonder if they can have rice paper when they’re on a diet, the following information about rice paper calories will help you make your decision. The number of calories in a piece of rice paper depends on the percentage of rice powder it contains. 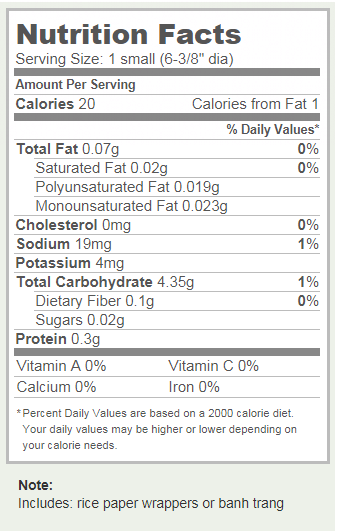 Some will be around 20 calories per piece, but others can reach to 35 or even 40 calories. Now I think you are ready to gain more insight about Vietnam’s many rice paper’s snacks. Does that look like a normal pizza to you? 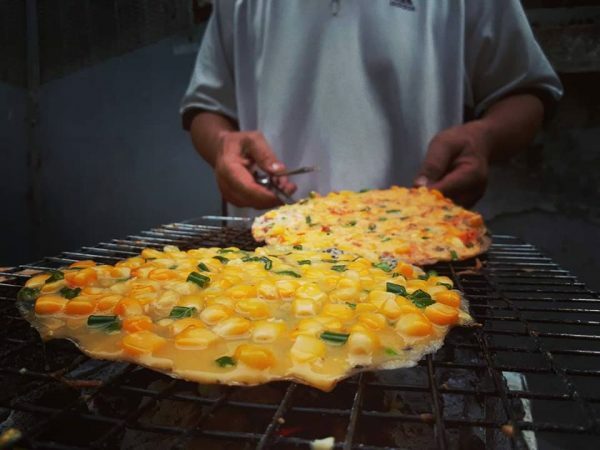 Grilled rice paper, or so called Vietnamese pizza, is one of the favorite snacks in Saigon. 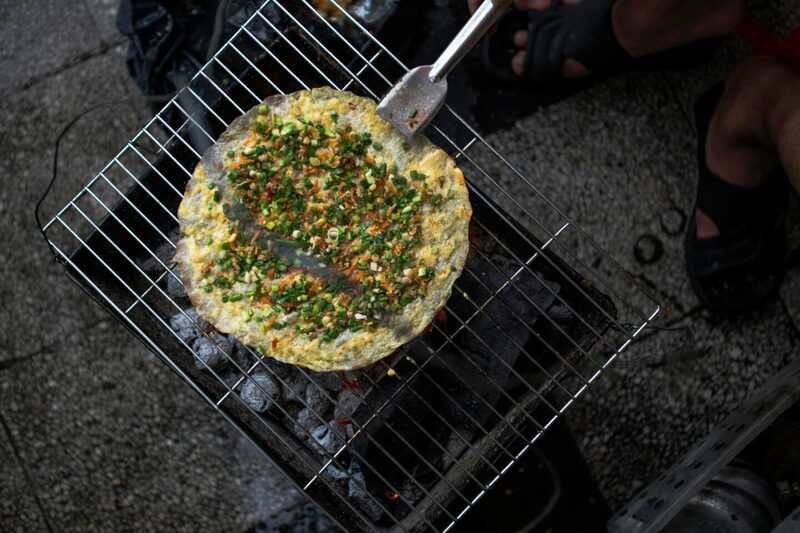 Rice paper is slathered with butter then grilled on coals with some cheese, eggs (either quail or chicken eggs), green onion, shredded pork, chicken or beef, and maybe some tiny shrimp on top. 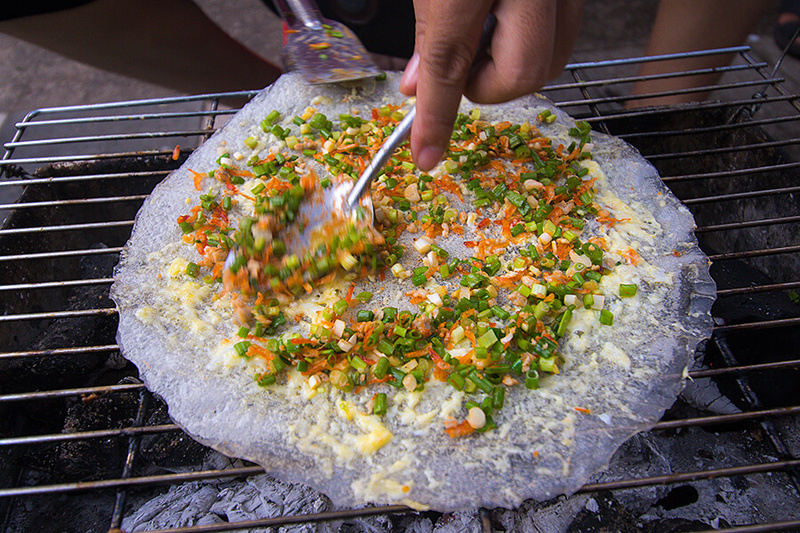 This combination is a common version of banh trang nuong (grilled rice paper) in Saigon. However, there is no definitive “traditional” way of making it. With many different types of rice paper, along with varied toppings, the creative Vietnamese can make up to 30 different options. The most popular styles of banh trang nuong are from Da Lat and Phan Thiet and are widely available in Saigon. The difference between Da Lat style and Phan Thiet style results from the topping. You will find rice paper from Phan Thiet with veggies (cabbage), whereas in Da Lat, you will find it mainly with green onion. There are a lot more interesting facts about grilled rice paper to read about in Izzy’s article on Vietnamese’s pizza. Check out her post below. Pull out a small stool and eat away. 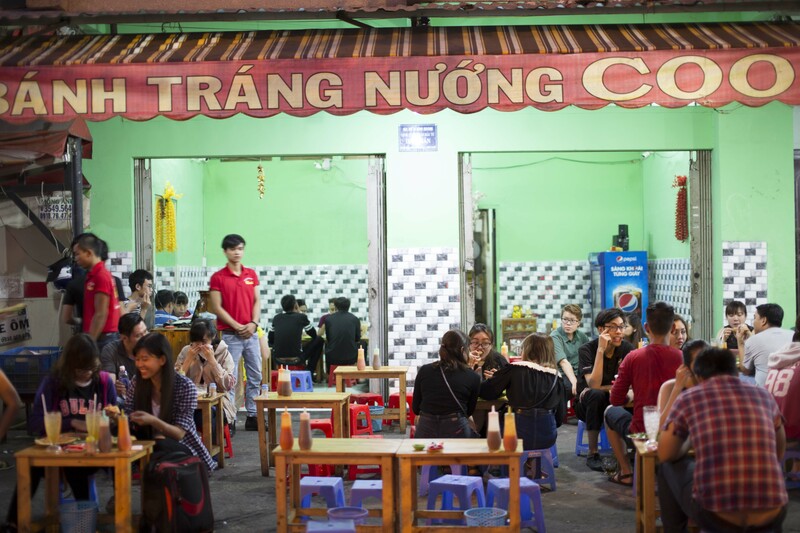 Located on the street running along the longest canal in Saigon, Banh Trang Nướng C002 is a top option. With a menu listing more than 50 types of grilled rice paper from Da Lat, Phan Thiet, and others areas, this place will offer you a grilled rice paper feast. Turtle Lake is a famous hangout spot for local teenagers. There are many different food stalls here and they are all open until late at night. Rice paper is one of them. They serve the basic kind of grilled rice paper here with quail eggs and green onions. It’s simple but tastes so good, especially during the cool afternoons of Saigon’s rainy season. The name states it all. If you are looking for Da Lat style rice paper, this is it. This spot is located on the sidewalk on Cao Thang Street and uses tiny plastic chairs as tables. It may be a bit uncomfortable for you to sit down, but the grilled rice paper here tastes like heaven. What are rice paper rolls? They are spring rolls, summer rolls… well, actually…, 99% of any kind of roll you’ve seen in Vietnam is wrapped with rice paper. And that’s why it makes sense for you to call them all rice paper rolls when you don’t know what else to name them. The spring roll (nem cuon or cha cuon in Vietnamese) has a crunchy exterior. Before being deep or pan fried, the spring roll is wrapped in rice paper (banh trang) with a mixture of egg, onion, garlic, minced pork, and other ingredients inside. There is no strict rule on what the ingredients should be. It can be carrot, taro, sweet potato, cellophane noodles, coriander, mushroom, shrimp, crab, etc. Let your imagination run wild. Summer roll, or salad roll (goi cuon), is another way to have your rice paper wrapped roll. Summer roll is a crisp, clean hand-crafted roll that isn’t fried (or cooked). It contains a vegetable-based mixture with some cooked crab, shrimp, or pork. Dip it in the fish sauce and feel the magic happening in your mouth. Stuffed rice paper roll (banh trang cuon) is the younger brother. This dish is a recent invention, and since its debut has never failed to satisfy foodies hunting for the great taste. Wrapped in moistened orange rice paper, and stuffed with shredded mango, quail eggs, salted tiny shrimp, shredded pork, beef jerky, and coriander, the roll has a beautiful, tasty look. You then pour oil, spicy sauce, spicy salt, mayonnaise sauce, and put some peanuts on . Finally, it’s ready to eat. 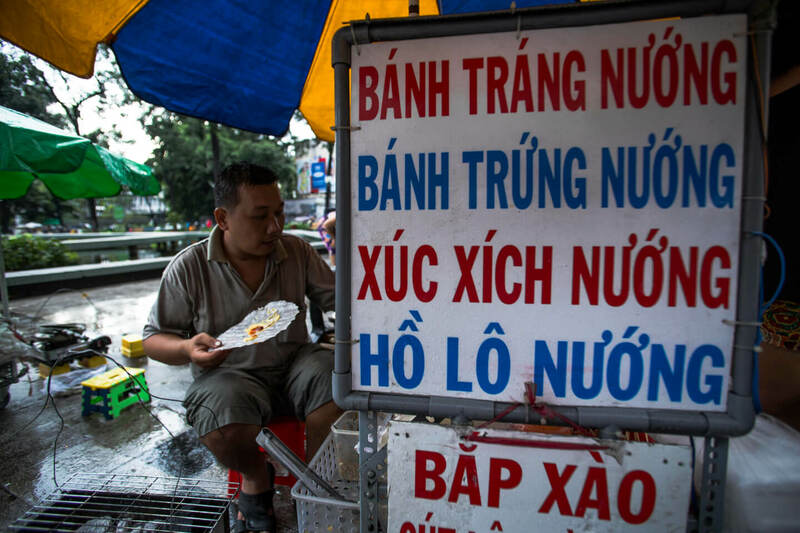 There are more and more types of rolls that exist in Saigonese’s list of daily snacks. This article will never end if I mention all of them. They all contain different ingredients, type of rice paper, the accompanying sauce, and whether they are fried or not. We’ll explore these differences in another insight article coming soon on our blog. Stay tuned. 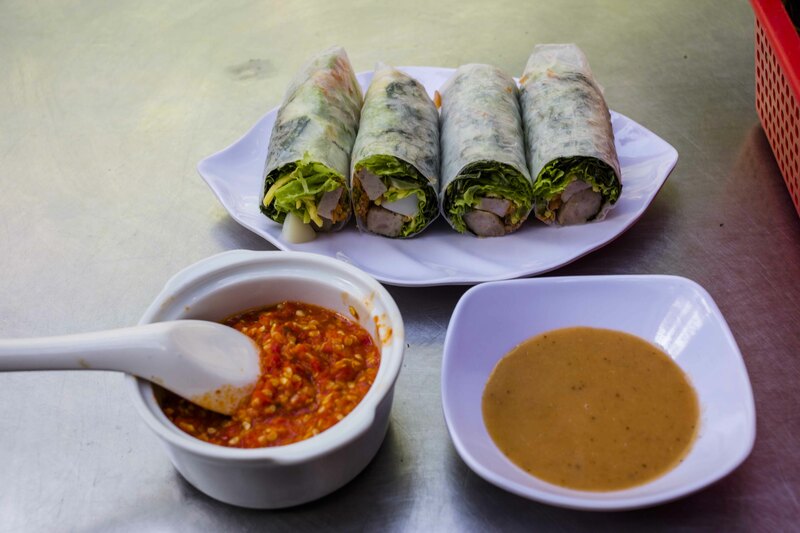 The Top Places in Saigon for The Best Vietnamese Rice Paper Rolls. 1. Secret Garden – Top floor, 158 Pasteur, D.1, HCMC. 2. Mountain Retreat – 36 Le Loi, D.1, HCMC. 3. An La Ghien Restaurant – 74 Suong Nguyet Anh, D.1, HCMC. *This restaurant also serves great banh xeo and banh khot (Vietnamese pancake and mini pancake). 4. Leaf Vegetarian Restaurant – 32A Cao Ba Nha, D.1, HCMC. If you are a vegetarian, no worries, this place has fascinating veggie-only spring rolls and summer rolls. It really is too easy to find a perfect Vietnamese rice paper snack here. 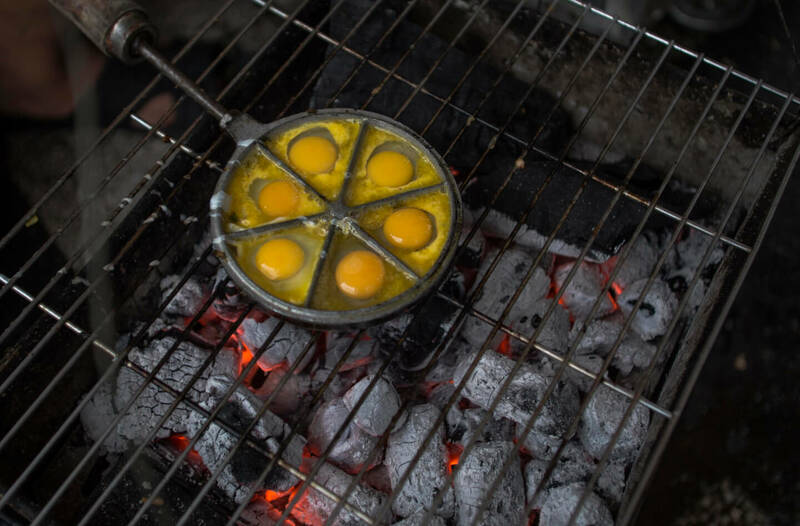 In addition to the rice paper snacks feast, the street food vendors in the area also sell a special dish called grilled egg cake (banh trung nuong). They cleverly use the tiny round cake mold which is divided into six tiny triangular sections. They put some butter in it, then quail eggs and green onions, and torch it. When they open up the cover of the cake mold, they pour in chili sauce and mayonnaise sauce, and it’s done. This street is full of ladies selling everything about rice paper. Stuffed rice paper is not the only thing. Pick a lady and enjoy your rolls on the spot. Hopefully, the information I provided has not only helped to enrich your food knowledge but also will satisfy your hungry belly as well. If you have any questions or want to tell us about your favorite rice paper snack, let us know in the comments below.